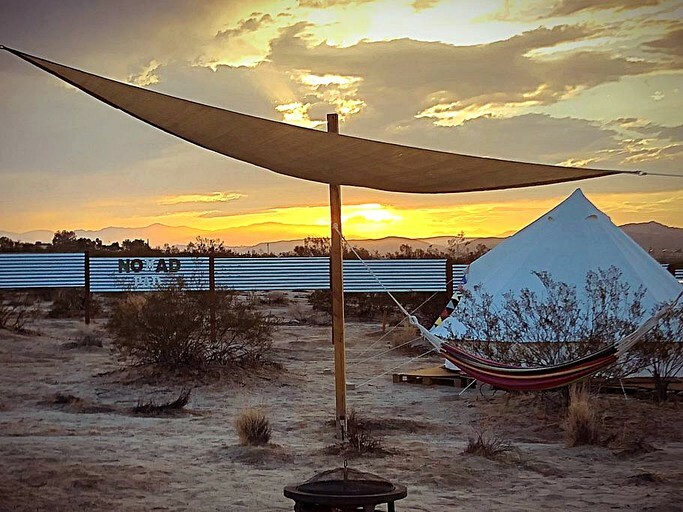 Glampers can escape the stifling urban haze with this unique, off-the-grid getaway experience near Joshua Tree National Park in California. 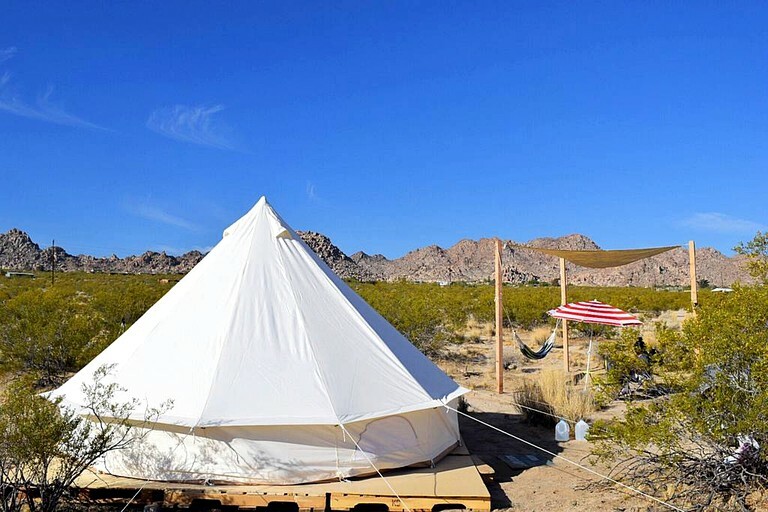 The bell tent is located on almost one and a half acres of magical desert landscape, surrounded by unrivaled natural beauty. 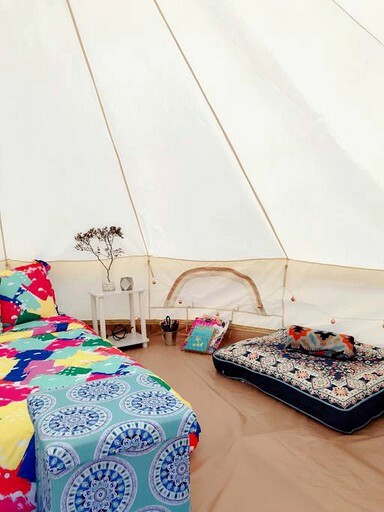 Here, glampers can unplug and reconnect with the great outdoors while enjoying the comfort of the queen-size bed that comes with cozy bedding, an extra comforter, and a sleeping bag. 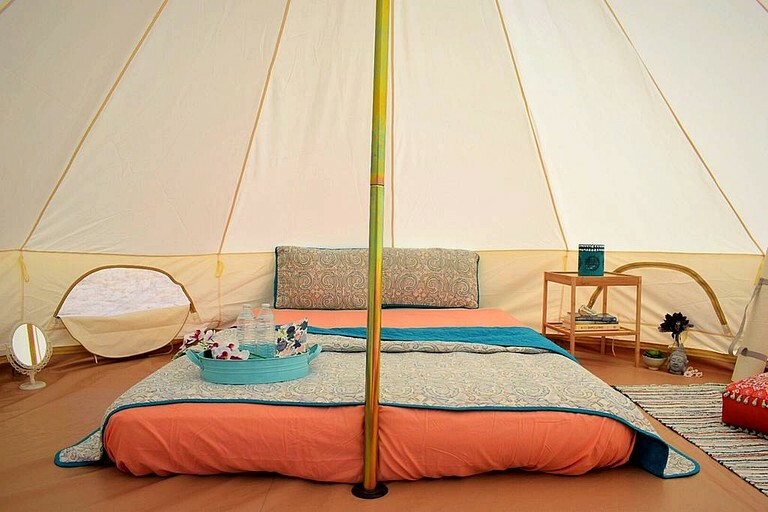 There are no showers on site; however, there is a porta-potty for glampers to use. 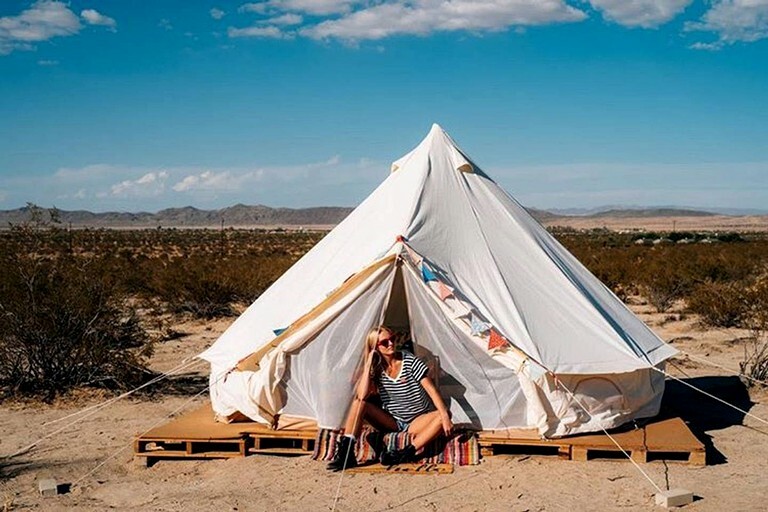 Guests will have the chance to totally unplug from the hustle and bustle of their daily lives and reconnect in a sublime natural setting, while glamping in style. 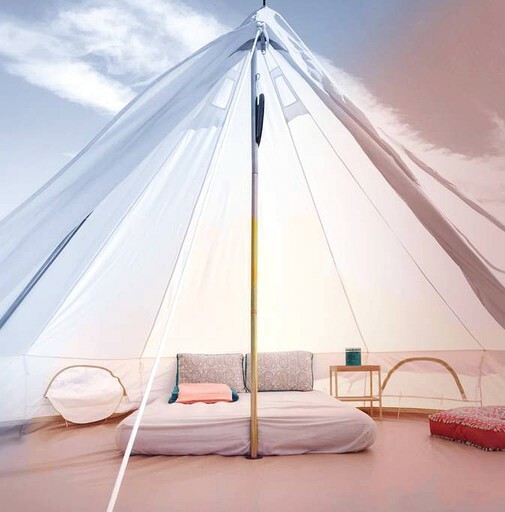 Nature will be the alarm clock each morning, and the stars will decorate the brightly lit up night sky each night, putting on a show before guests sink into their cozy tent retreat. 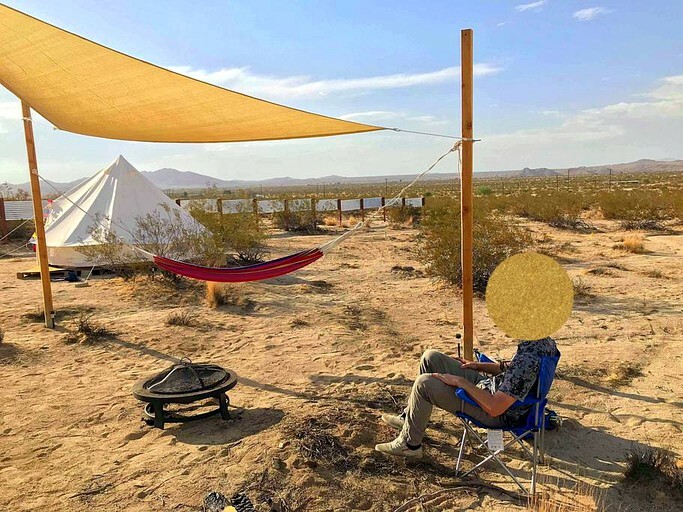 Outside of the bell tent, guests will find a lounge area protected from the sun by a canopy tent, with a hammock for relaxing while staying cool. 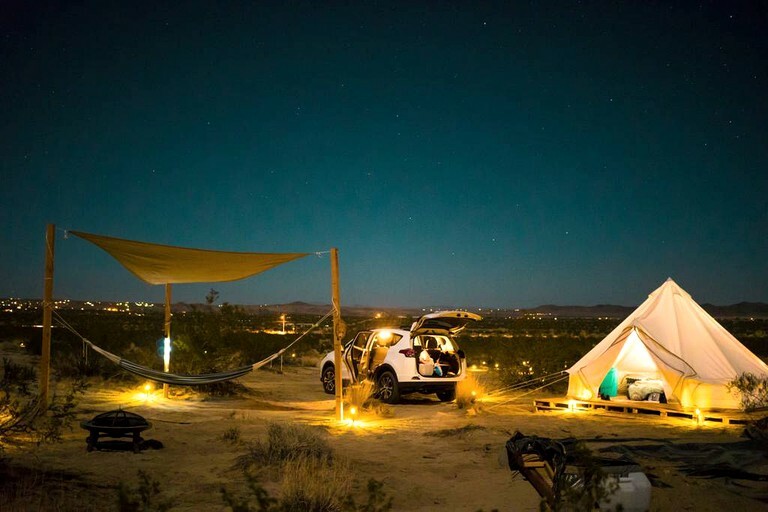 This is a prime spot to take in nature’s majesty at night while the sky puts on a show full of stars. This lounge area also has lounge chairs with cupholders. 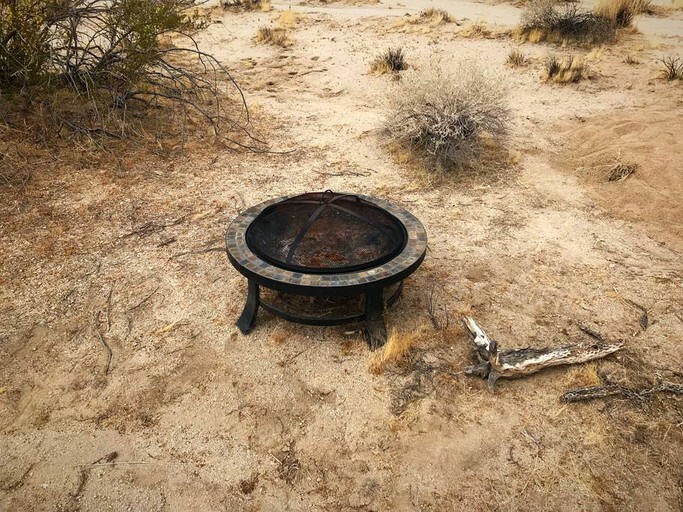 There is a fire pit for roasting marshmallows and keeping warm during the cooler months. 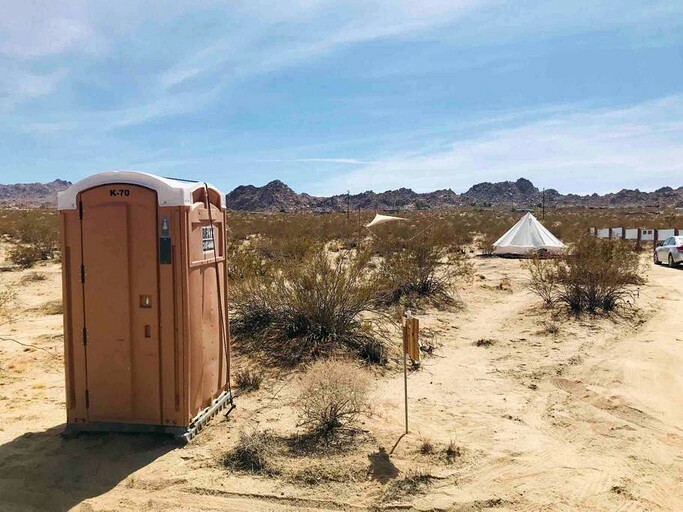 On-site, guests will find a porta potty portable restroom facility with a toilet and a sink. 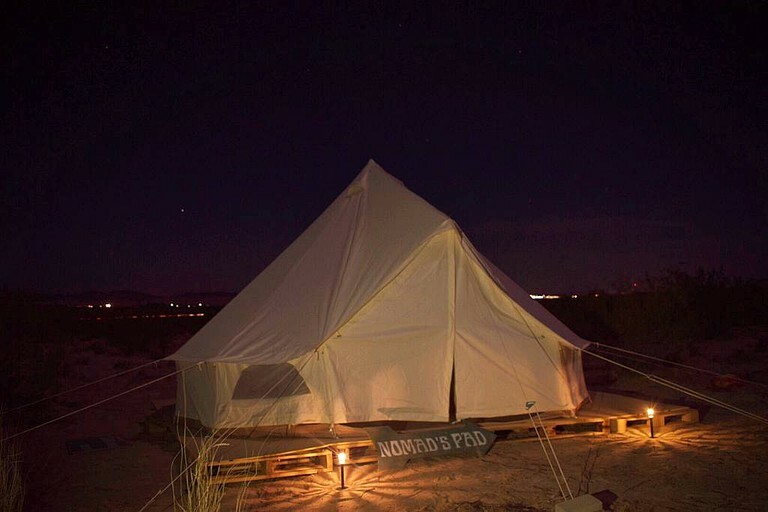 Other amenities include lights inside and outside of the tent, a propane heater provided during colder months, bottled water, and plenty of free on-site parking. 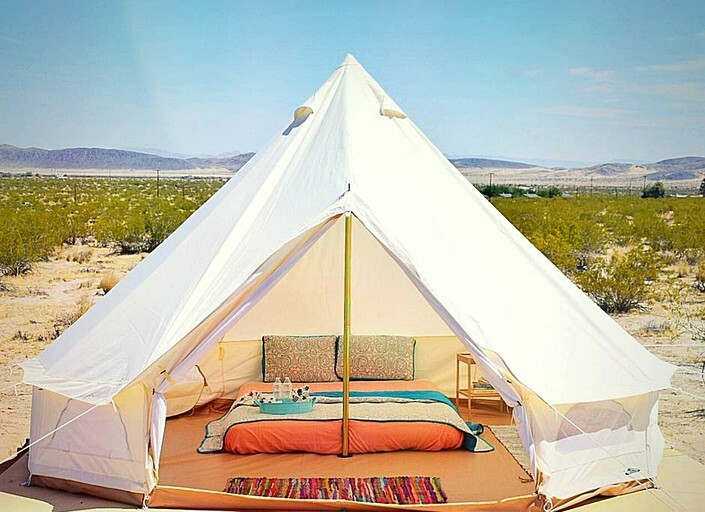 This stylish bell tent is located just minutes away from the Northern entrance of the Joshua Tree National Park Visitor Center, straddling the neighborhoods of Downtown Joshua Tree and Panoroma Heights, in Southeastern California’s Mojave Desert. 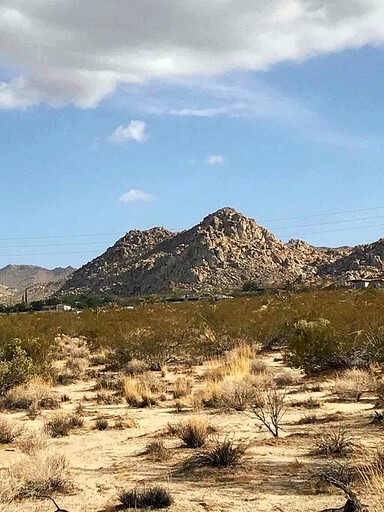 Situated 140 miles east of Los Angeles, this natural splendor of rugged rock formations, hiking trails snaking through the desert, world-class climbing, and scenic drives will leave guests mesmerized. 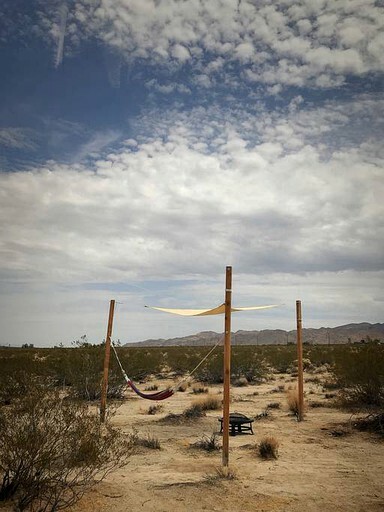 With otherworldly views of entrancing Joshua trees set against stark desert landscapes and unparalleled proximity to the National Park, glampers will have the unique opportunity to experience truly rustic, Wild West style living on open land. 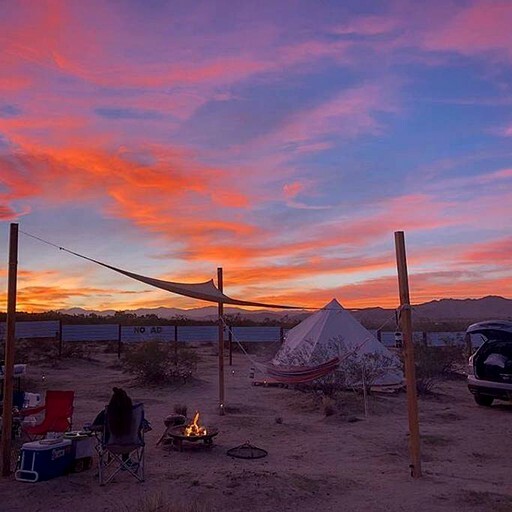 This glamping site is located just four minutes away from the Northern entrance of the Joshua Tree National Park Visitor Center, where guests can embark on a long list of adventures by day, and stargaze under unpolluted skies by night. 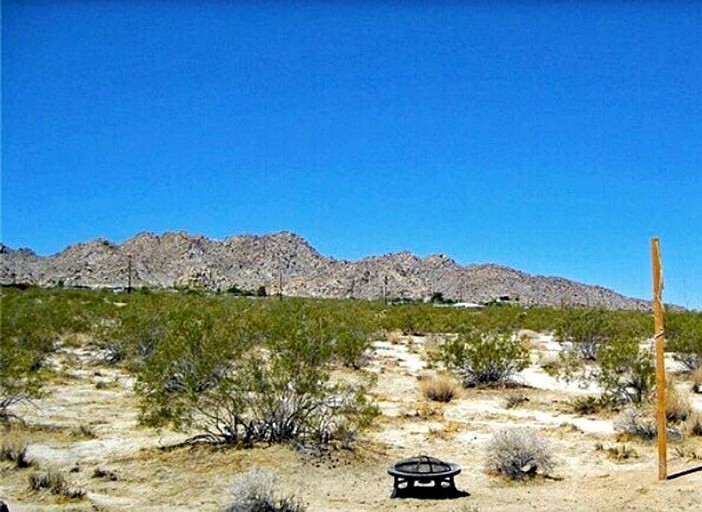 This property is a convenient five minute drive from the Northern entrance of the Joshua Tree National Park, where guests can set out on full days of hiking, climbing, and capturing otherworldly views of the desert. 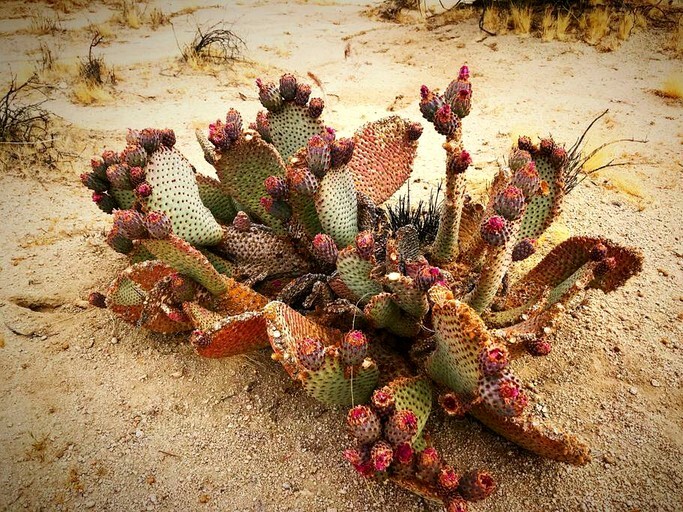 A few key points of interest inside the National Park include the Indian Cove Nature Trail, Echo Cove for rock climbing, Arch Rock Trail for hiking among giant boulders, walking among cacti in Cholla Cactus Garden, or checking out some easily accessible sunset views at Keys View. 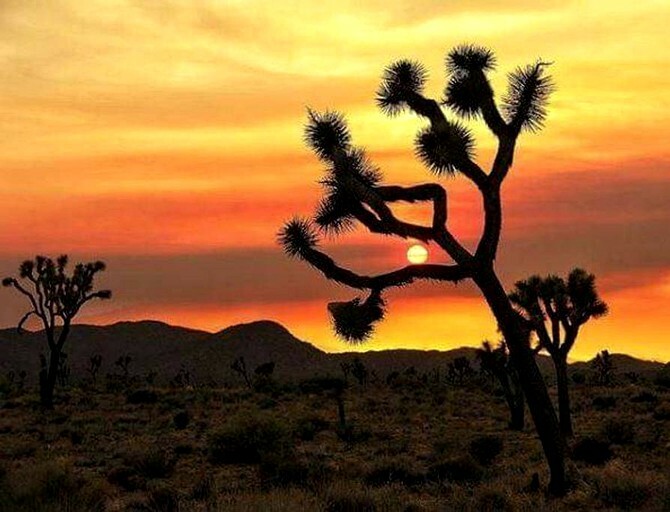 Those less inclined to tour on foot can access the park by car, easily starting from the south side of the park at the Cottonwood Spring Visitor Center and exiting through the town of Joshua Tree. It will take at least four hours to see the park with its many viewpoints and attractions, with opportunities to make quick stops for short distance walks and snapping photographs. 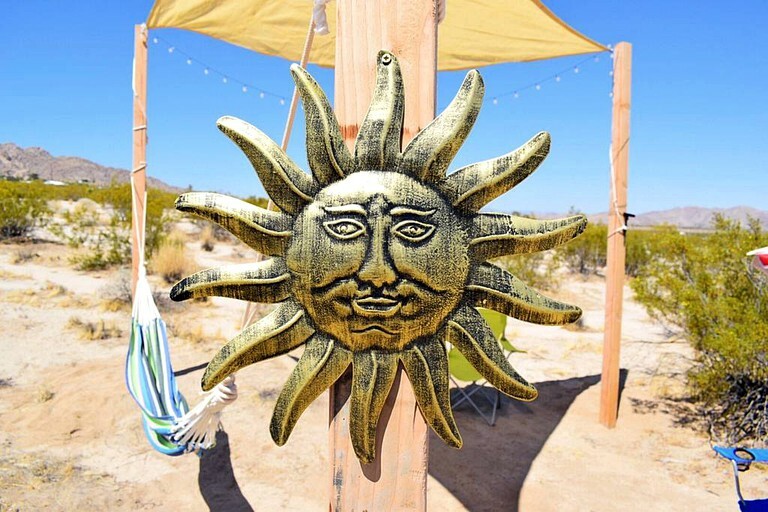 The property is less than five minutes away from historic downtown Joshua Tree, which today maintains its funky reputation established in the 1960s. This progressive town offers a wide variety of restaurants, diners, markets, organic health food stores, eco markets, salons, wellness services, yoga, and much more. 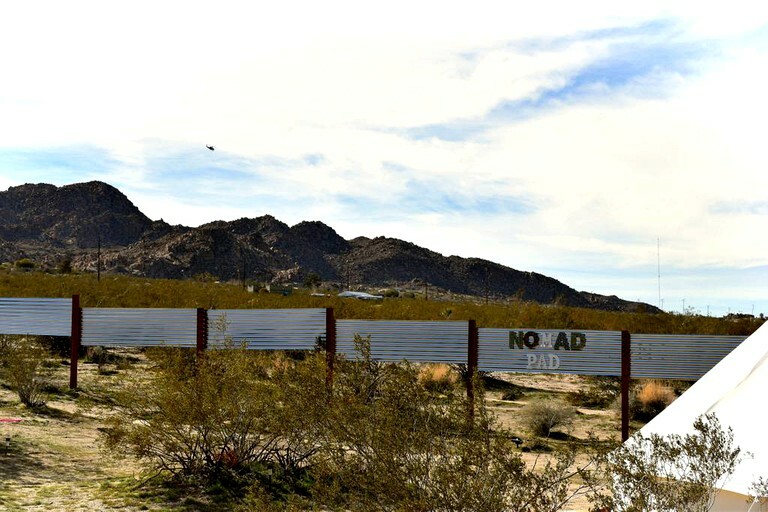 The Smith Ranch drive-in movie theater in Twentynine Palms is a classic venue, where guests can catch a $5 flick and snacks from Thursday to Sunday. 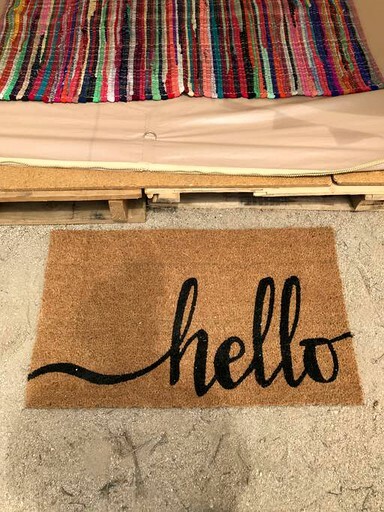 A damage deposit of $100 is held on the guest's card at the time of confirmation and will be released back to them 7 days after check-out pending no damages. This property does not allow pets, smoking, parties, or events. Only service animals are allowed, and guests must notify the host before booking. An additional $25 pet cleaning fee will be applied, charged after booking. This property is not safe or suitable for children 12 years old or younger. Please note that while children are allowed to stay on the property, guests should keep in mind that this property is on raw land. 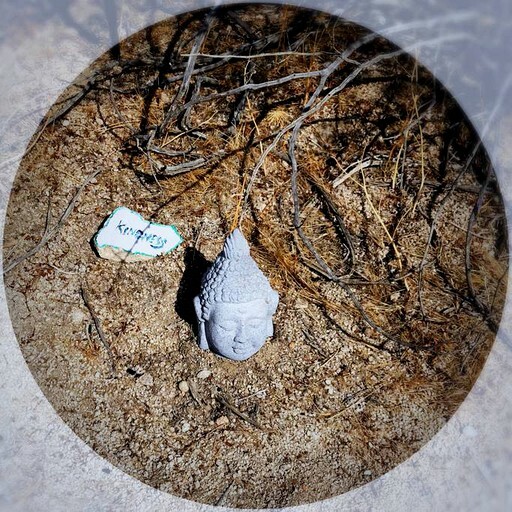 Retreats, photo shoots, video shoots, etc are allowed subject to host pre-approval. Applicable licenses, permits, liability insurance, and/or other supporting documentation may be required. An additional $200 plus $100 cleaning fee will be charged at the time of booking. No exceptions. Filming and professional photo or video shoots are allowed subject to host pre-approval. Applicable licenses, permits, liability insurance, and/or other supporting documentation shall be required. No exceptions. An additional $500 location fee plus $150 cleaning fee will be charged at the time of booking. 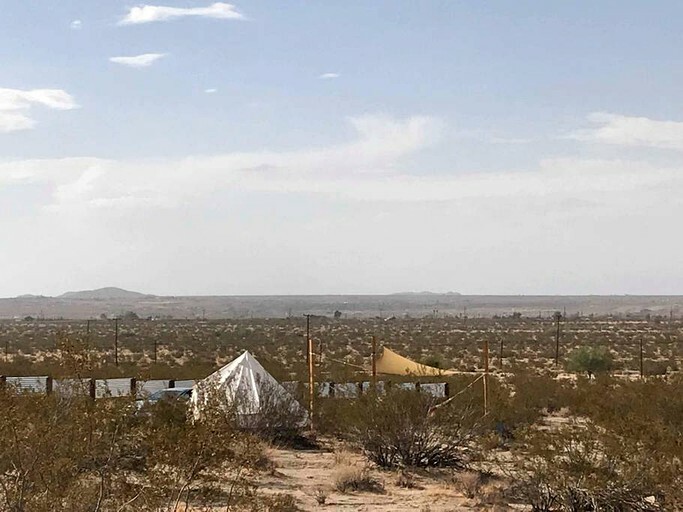 Guests should keep in mind that this is an off-the-grid glamping site, so there is no running water or electricity and cell phone coverage may be limited. 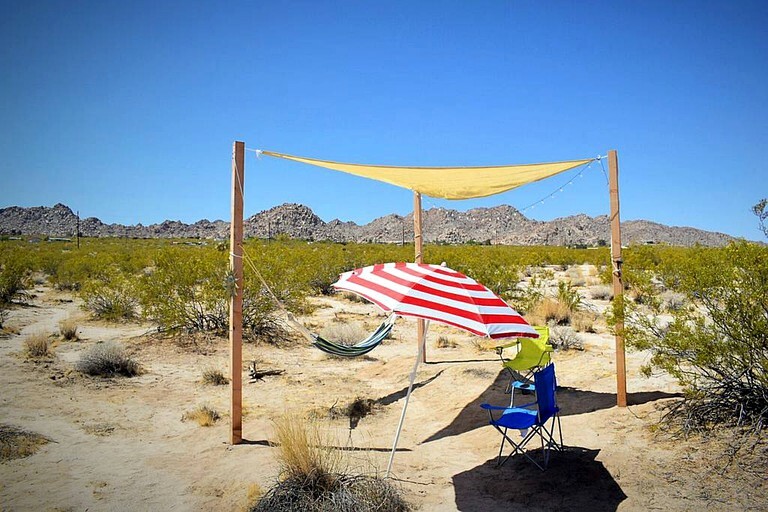 The accommodation is totally solar, battery-operated, and/or propane powered. Limited drinking water is provided so guests should come prepared with enough to last the duration of their stay. Open fires are prohibited; however, small, contained fires are allowed.